Giovanni and I are going on just over a year of nursing strong! A big part of my success in nursing for so long is owed to nursing friendly clothing that makes it easy for me to to feed my little man on demand at home, or while we are out and about. I can’t tell you how often I have to sacrifice style over that necessity when it comes to my every day wear. Lucky for me, I’ve recently come upon PinkBlush and their line of nursing friendly clothing! Do you know how exciting it is to finally feel like style doesn’t need to be compromised in order to nourish my son? Its easy to feel so frumpy in loose clothing, especially in those early postpartum days where you are feeling anything but beautiful. 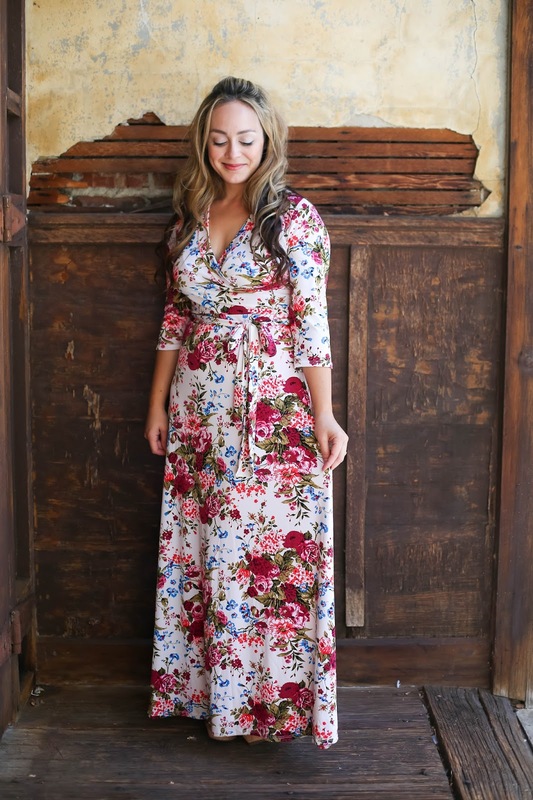 Not only is their line of clothing mostly nursing friendly, but they also have a fabulous line of maternity wear that is made to last you throughout pregnancy and into your postpartum days. I often get asked by people how long I will continue to nurse Giovanni and the answer is not yet clear. Maybe I will start weaning when he is 1 1/2, maybe at 2. Maybe I’ll just let him decide when he no longer needs it. At this point I don’t have a real plan… I’m just taking things one day at a time and rocking my stylish, nursing friendly PinkBlush clothes until that day arrives. Are you a pregnant or nursing mama who could use a few PinkBlush items for yourself? You’ll want to head over to my Instagram page where you can win a $75 PinkBlush credit to experience all the feels with their gorgeous line! I received the above mentioned item(s) courtesy of PinkBlush in exchange for a review. As always all thoughts and opinions are 100% my own. You are so gorgeous friend!!! Love this dress on you! Love this dress! I always felt like I was sacrificing my look in exchange for feeding my son. You look absolutely stunning my friend! You are stunning! Love that dress! that dress is so perfect! you look amazing! This dress is gorgeous on you!! You look stunning!!! And you go mama; breastfeeding superstar! You are absolutely gorgeous! Love the dress! And way to keep up that breastfeeding. I made it to 17 months with Avery and was so glad I did! This dress is stunning on you! Congrats on continuing to nurse your little one! what a gorgeous dress! That's fantastic that you can wear it while nursing! love it! This looks so beautiful on you! I wish I would of known about this company! Great job nursing your beautiful baby! I went to 1 1/2 with my last but, that was because I was going on a trip with my husband but, do whatever is best for you! That dress is so gorgeous, I love Pink Blush. I agree, ease of access is key when you're still nursing! All of my kiddos have kind of weaned themselves around 14-15 months, which is always a bittersweet time for me. Nicole, that dress is gorgeous. & you look amazing in it. You look gorgeous! Such a lovely print! Your story us exactly what I went through with both my kids. I still wear loose,frumpy ab's or maturnaty clothing because of breastfeeding and my weight not being back to before. I am so glad I read your story and will definitely look into this maturnaty line. Thank you for sharing.